These are some of the current Agassiz boys, please see our Tribute page for others that contributed so much to our breeding program as well. Deacon was a high energy, fun loving dog. He was a multiple Group Placer, won 5 Best Puppy in Groups and a Best Puppy in Show, all achieved by 10 months of age. Passed in 2018 coming into his 15th year, he is sorely missed here at Agassiz. Deacon was a cornerstone of our breeding program.. He is the proud father of our two conformation stars - BISS, Multiple BIS, PBIS GCh. Agassiz's Wild Blu Yonder, HIC, RN, CGN, VS and Multiple BPIS Ch. Agassiz Krystal Blu Persuasion, CGN, HIC, VS and grandfather to MBIS, RBIS, 3X BPIS, Can GCHX and Am GCh. AGASSIZ’S WHISKEY ON THE ROCKS, CGN, HIC, VS (aka Whiskey). He was an incredibly versitile dog. Yonder was a Best in Show Specialty winner (ACDCC National Specialty 2011), multi Best in Show winner and a Reserve Best in Show winner, Yonder had over 100 groups placements to his credit and he was Canada's top conformation ACD for 2006, 2007, 2009 and 2010. 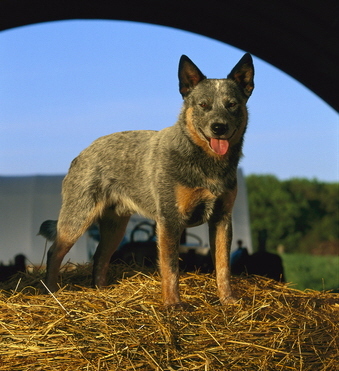 He was also the first ACD in Canada to obtain a Grand Champion title! His offspring are starting to show promise as well. Whiskey is a very vibrant young dog that loves to do just about anything. He excelled in the show ring and is now working nicely with herding. Whiskey finished his Canadian Championship as a puppy with multiple Group placements, 12 Best Puppy in Group wins and 3 Best Puppy in Show wins! During his show career he boasts multiple Group 1st wins, multiple Best in Shows and he is a 2X Puppy Sweepstakes Winner (ACDCC National Specialty and Maritime Group 7 Specialty 2011). He has also finished his American championship in style taking 3 majors (back to back), winning Best of Breed over Specials and has now obtained his American Grand Championship! 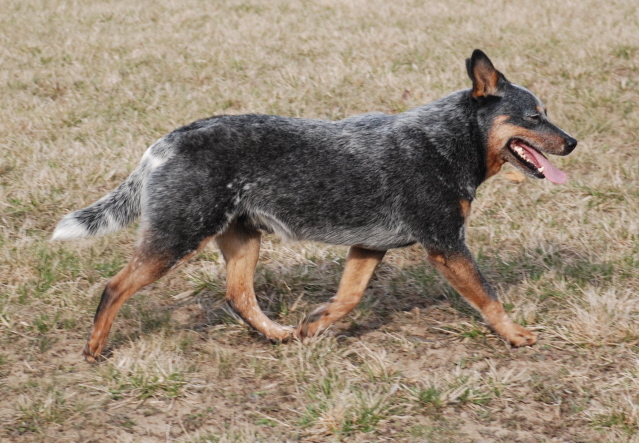 Whiskey was the top conformation ACD in Canada for 2011 and 2012. He is following in the footsteps of his mother Ch. Agassiz’s Krystal Blu Persuasion, HIC, CGN, VS and his grandfather, Ch. Agassiz’s Dreamtime Deacon Blu, HIC, VS and his cousin, BISS, Multi BIS & BPIS GCH Agassiz's Wild Blu Yonder, HIC, RN, CGN, VS.
GCh. Agassiz's Come From Away, RN (aka Joey, owned and loved by Cindy Cavanagh in Nova Scotia). Multiple Group Winner, Multiple Group Placer, Sweepstakes Winner, Multiple Best Puppy in Group Winner. 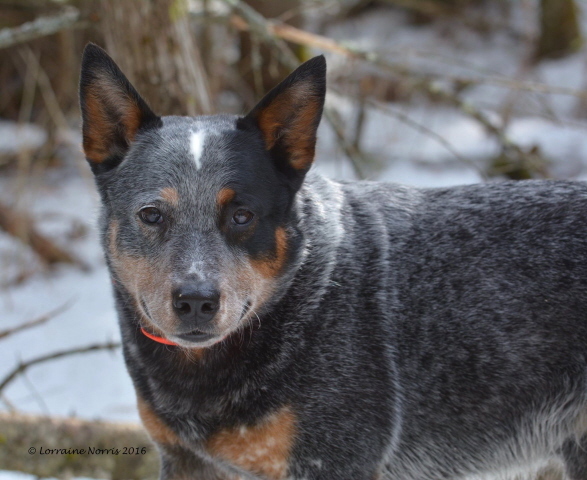 Joey has consistently placed in the Top 5 ACD in Canada the last three years. Available at stud to approved females. GCh. Agassiz N Austyln Heading East (aka Billie, also owned by Cindy Cavanagh) is a Best Puppy in Show winner, Multiple Group Placings and a Group Winner and Multiple Best Puppy in Group winner as well. BOSS Am. Ch. Aquila's Hot Dam Here I Am (bred by Lynda Rocksvold/Jane Ward, owned by Marc Philpott) Hottie won her 15-18 month class at the ACDCA National Specialty 2014 and was Best of Opposite at the ACDCC National Specialty in 2016 and has also completed her Canadian Championship as well. Hottie's offspring have also shown and done well too. GCh Austlyn Country Girl is Sassy (bred by Lynda Rocksvold/Jane Ward, owned by Vickie Hall) is a multiple Best of Breed Winner in the US and is currently in the top 20 ranking for the breed. BISS, RBIS, BOSS, BPIS, Ch. Austlyn Ksenia's Racin Four T Square (bred by Lynda Roacksvold/Jane Ward, owned by Barb Loitz). Jimmie is a Best in Show Specialty Winner ACDCC 2014, a Reserve Best in Show Winner, a Multiple Group Winner/Placer and Best Puppy in Show Winner. Whiskey also has progeny in Germany that are champions, specialty winners and have multiple group wins and placements.